Those who know me know I’m somewhat of a monster fan. Real monsters, I mean. Well, at least I think they’re real. You know, the Loch Ness Monster, Sasquatch, that sort of thing. Yes, I think there is a Bigfoot. And yes, I think there is a Loch Ness Monster. UFOs? I believe something is out there, just not sure what. Call me weird. Call me gullible. I’ve heard it all before. And I don’t care. What aggravates me are the throngs of individuals out there who give us “believers” a bad name because, well . . . how do I say this tactfully? They’re idiots about the whole thing. You can find an article and lots of images here: http://www.dailymail.co.uk/news/article-2607667/Is-THIS-Loch-Ness-Monster-Apples-Maps-satellite-image-Nessie.html. It’s very interesting and intriguing and at first I thought we were on to something. Now here’s the rub that sends the idiot meter through the roof. According to the article the “Official Loch Ness Monster Fan Club” had “experts” examine the photo for six months and allegedly have ruled out many explanations. Notice anything similar? The above boat is located at the northern-most tip of Loch Ness. It’s right there on Google Maps; you can see it for yourself. 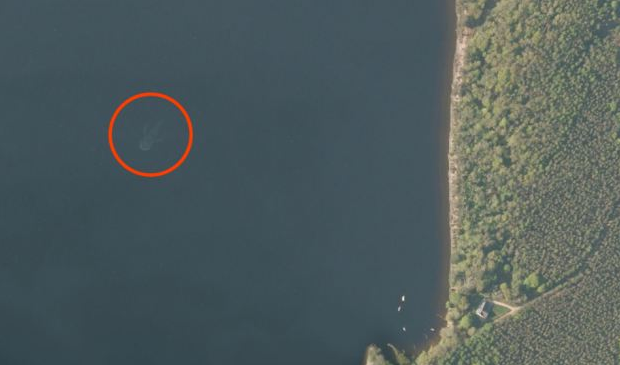 Check out the wake then compare it to the image of “Nessie” that has stumped “experts” for six months. Is the first photo a hoax and the boat has been digitally removed? Is it some weird glitch in the satellite’s photo? Who knows. But it’s clear that the first photo is the wake minus the boat. Posted on April 21, 2014, in Weird Science and tagged Bigfoot, Loch Ness Monster, Nessie, Official Loch Ness Monster Fan Club, Sasquatch. Bookmark the permalink. 4 Comments. Grrrrrr, this makes me angry. Like you, I’ve always felt the Loch Ness Monster a real possibility. God may very well have created creatures that have existed for centuries in the deep depths successfully avoiding humans. I’m 63, and in my lifetime, I’ve watched TV “specials” about the discovery of some pretty bizarre sea animals which were discovered while scientist searched areas of the ocean never expired before. So why not a Jessie? Apparently there is not enough algae in the Loch to support an creature of that size, so the experts reckon. What do you think?